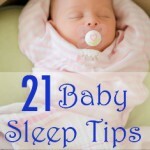 Babies sleep up to eighteen hours per day, and they’ll zonk out just about anywhere. This is especially true in the first few months, when they generally divide their time between eating, sleeping, and filling the diaper. I’m always amazed at how babies and toddlers can sleep in what seems like incredibly awkward positions, for hours and hours, but wake up refreshed and ready to go. In this article, we’ll talk about some of the common baby sleep positions, including ones that are safest, help address a problem, or are just downright adorable. The crib is the safest place to put your baby to sleep, according to the safe sleep guidelines put out by the American Academy of Pediatrics (AAP). Two quick notes: if you buy a new crib, be sure you assemble it correctly and tighten all of the screws. 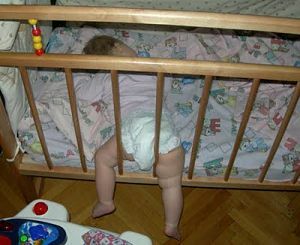 Note, if you obtain a used or second-hand crib, be certain that it’s not one of the drop-side models. Those have been discontinued due to safety issues. Speaking of which, you shouldn’t use crib bumpers in your crib, no matter how cute they are. No matter how much you paid for them. Back to Sleep is a national baby sleep safety campaign in the U.S. designed to encourage parents to put their infants on their backs to sleep. This is considered the safest sleeping position for an infant, because it reduces the risk of SIDS by helping prevent newborns from smothering. Incidentally, the AAP also recommends a firm, fitted mattress for your crib. It shouldn’t be super-soft like a pillow-top mattress. 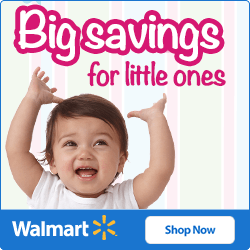 See our article on the 3 best by crib mattresses for some good examples. TVs. They don’t make ’em like they used to. 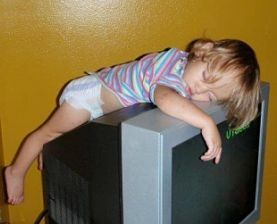 A few decades ago, most babies were put on their stomachs to sleep. 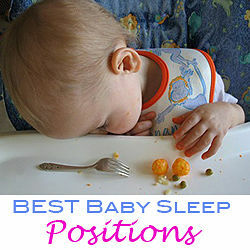 The thinking was that it would help in case they spit up, and babies were quite comfortable sleeping in that position. Unfortunately, belly sleeping is no longer recommended because it increases the risk of suffocation. By the time your little one is 12 months old, however, they’ll be quite capable of rolling around in the crib, and they may often end up on their bellies. But at this point they’re generally strong enough to move if they have trouble breathing, so it’s less worrisome. 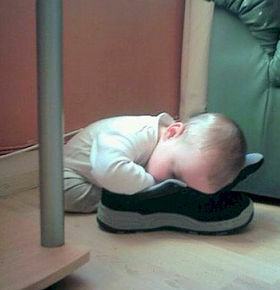 Some parents are in favor of putting the baby to sleep on his side (or they have a baby that seems to prefer it). At the newborn stage, this is less desirable because it’s easy for the baby to end up on her stomach. As I said, though, an older baby (6-12 months) might grow to enjoy this sleeping position, and there’s not much you can do about it. Don’t worry, but just be sure there are no pillows, stuffed animals or loose items in the crib. If your infant has reflux or colic — in other words, tends to spit up a lot — you should still put him on his back to sleep. However, to put gravity on your side, you can elevate the head of the crib using a different height setting. Or, in a pinch, just put a phone book between the mattress and the crib board. The elevation should be slight (less than 10 degrees). Your baby’s sleep position is important, and you should encourage safe sleep by always putting your baby on his or her back in the crib. However, it’s also important not to buy into the hype. I’m talking about the so-called baby sleep positioners that claim to reduce the risk of SIDS by keeping your baby in the middle of the crib and on their back. These things are not recommended by pediatricians, and they actually pose a hazard. The second your baby wiggles out of them, they’re just another suffocation hazard in the crib. 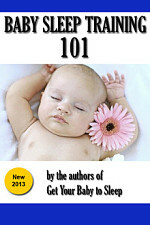 If you’re not convinced, read my article on the myth of baby sleep positioners. There are people that co-sleep with their babies. In some cultures, especially in second- and third-world countries, it’s quite common. Even in the U.S. there are many parents who bed share. Most of them take steps to do it “safely” by having a defined space for the baby, removing loose blankets and pillows, etc. Aside from the late-night nursing convenience, I can’t see what the benefits are. But I won’t tell you what to do; I don’t need a bunch of people leaving comments about how co-sleeping is perfectly safe and they raised 9 children doing it without issue. 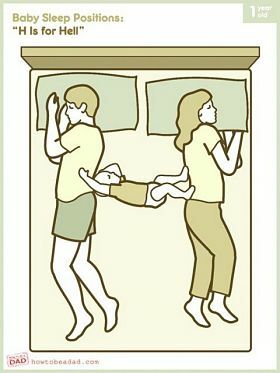 Instead, I will point out that the baby sleep positions outlined above also apply to co-sleeping situations. Back sleeping is best! If you want to sleep close to your baby, but don’t want to bed share, consider one of the co-sleeping bassinets like the Arm’s Reach that fit right up next to your bed, keeping your baby close to you but in a safe little place of his own. The ironic thing about baby sleeping positions is that newborns will sleep just about anywhere, any way, and there’s really one perfect option: on his back in a crib with a fitted mattress and nothing else in it. As they get older, you become less worried about SIDS and also less able to control how they sleep. Inevitably, when I sneak in to check on my boys, one of them is buried in his blankets like a homeless person, and the other is sleeping in a half-crawl position, crammed up against the side of the crib, both of them virtual poster children for the “don’ts” of baby sleep safety. So trust your own instincts and do what you think is best.